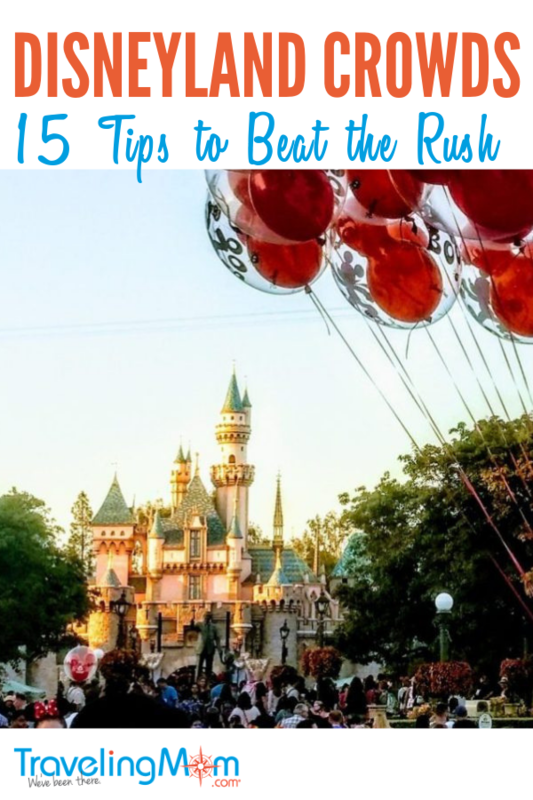 Even when Disneyland is crowded, there are ways you can beat the rush! Photo credit: Gwen Kleist, Healthy TravelingMom. 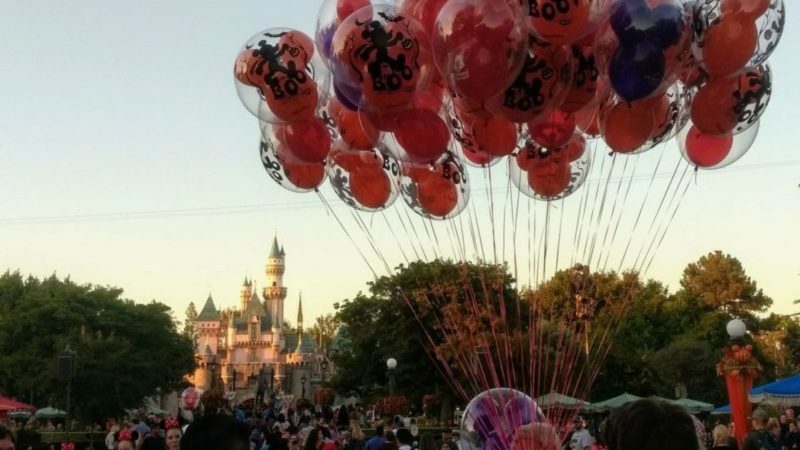 Disneyland has seen tremendous growth in the last couple of years, and with the opening of Star Wars: Galaxy’s Edge (aka Star Wars Land) this summer, crowds are only expected to get bigger. But don’t let the thought of long lines keep you away from the Happiest Place on Earth. There are many ways to minimize the time you’ll spend waiting in line and maximize the number of fun things your family can do in a day. This guide will show you how to beat the crowds and have an amazing time at the Disneyland Resort. When Star Wars: Galaxy’s Edge opens, it is sure to bring bigger crowds to Disneyland. Photo credit: Disney Parks. Arrive early to the parks. Enter Disneyland via the Monorail. Take advantage of Magic Mornings. Ride popular attractions with the shortest durations first. Download an app to check wait times. Take advantage of single rider lines. Slow down in the afternoons. Use mobile food and beverage ordering. When life gives you lemons, make lemonade! Or in this case, when Disneyland gives you massive crowds, use your app to order a Dole Whip and get a FastPass. 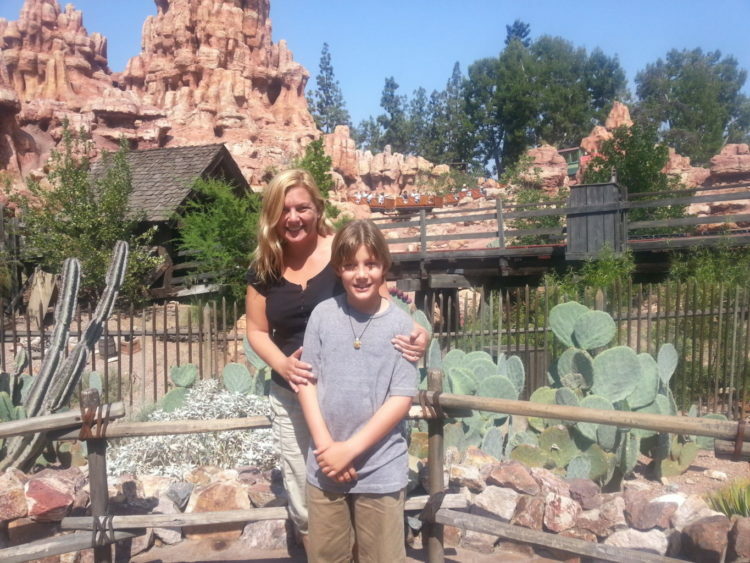 Visiting the Disneyland Resort in Anaheim, California when the parks are packed does not have to be a headache. Here are 15 insider tips to help you beat the rush at Disneyland and Disney California Adventure Park! 1. Know When to Go. While Disneyland is always going to be busy – especially with the new Star Wars Land about to open – some days will be more crowded than others. Here are the times of the year when you can expect bigger crowds at the Disney Parks. You can also expect larger than usual crowds during Halloweentime, especially on nights that feature Mickeys Halloween Party. Also plan on big crowds at the end of August when summer block out dates end for annual passholders. 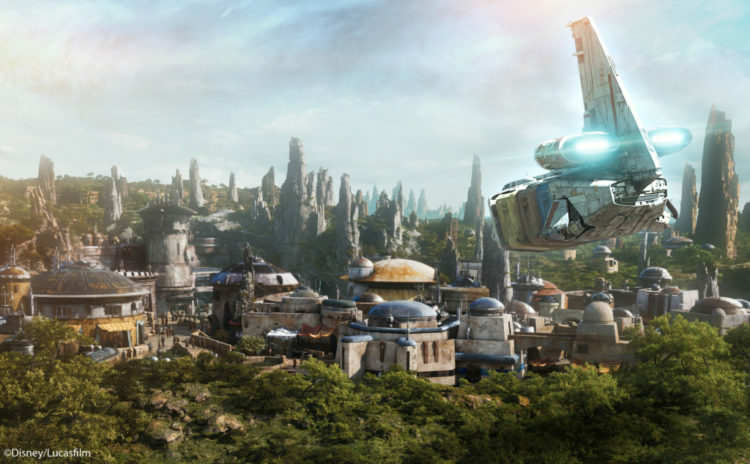 READ MORE: When Will Star Wars Edge Open at Disneyland? 2. Arrive Early to the Parks. Hands-down, the absolute best advice you can get to beat the rush at Disneyland is to arrive early. The crowds are lightest at opening time. Arrive 15-30 minutes before the parks open to take advantage of lighter crowds. That doesn’t mean pull into the parking structure early; you want to be parked, transported from the lot, through security and at the gate with tickets in hand 15-30 minutes prior to opening. This will ensure that your family is able to take full advantage of the parks while those other guys are still parking and making their way through security. 3. Enter Disneyland via the Monorail. If you’re not able to take advantage of a Magic Morning or Extra Magic Hours (see tip #4), consider entering the Disneyland Park via the Monorail instead of coming through the main gate. Located in Downtown Disney, the line for the Monorail is almost always significantly shorter than the lines to get in the main gate, and you can wait in the shade for the next train to arrive. 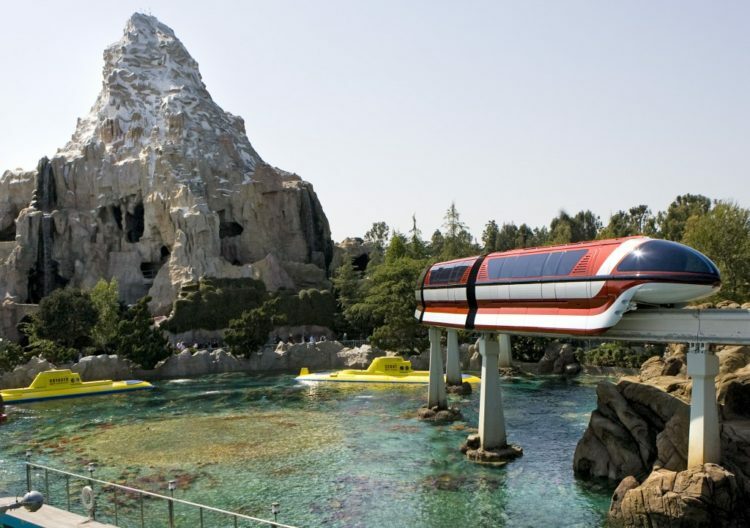 The Monorail’s single stop will drop you off in Tomorrowland, so you’ll get the added bonus of arriving close to Autopia, Finding Nemo Submarine Voyage, Space Mountain and the Matterhorn Bobsleds. So while the crowds are entering the front of the park and coming up Main Street, you’ll already be in the back of the park, having a blast in Tomorrowland before it gets overrun with other guests! Beat the rush to enter Disneyland by taking the Monorail! The Disneyland Monorail will whisk you from Downtown Disney directly to Tomorrowland. Photo credit: Paul Hiffmeyer/Disneyland. 4. Take Advantage of Magic Mornings. 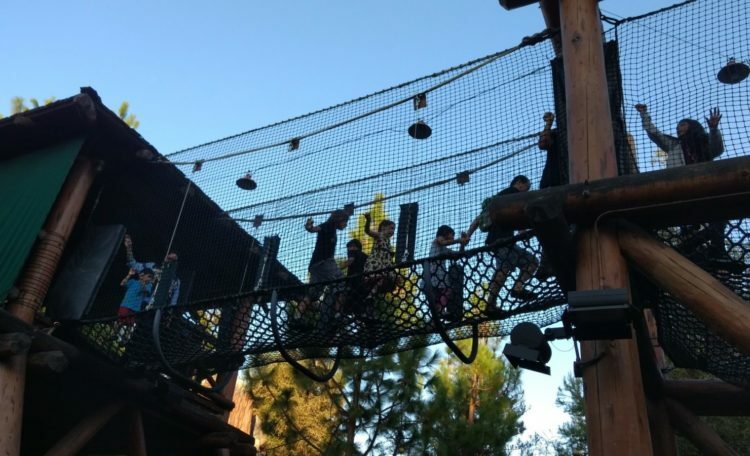 If you stay at one of the Disneyland Resort’s three hotels – the Grand Californian, Disney’s Paradise Pier Hotel or the Disneyland Hotel – your family will be able to access one of the parks one hour early each day of your stay. These “Extra Magic Hours” are one of the most valuable benefits of staying on-property. If you’re not staying at a Disney hotel, don’t despair! There’s still a way to get that extra hour. With “Magic Morning,” guests with a 3+ day ticket can get early admission to select attractions, stores and dining locations in Disneyland Park for one hour before the park opens to the general public. Magic Mornings at Disneyland Park are currently available on Tuesday, Thursday and Saturday. TravelingMom Tip #1: If you’re going on a Tuesday, Thursday or Saturday and do not have the Magic Morning benefit, visit Disney California Adventure instead, as Disneyland Park will have those extra crowds. TravelingMom Tip #2: Magic Morning guests with Disney MaxPass can start making mobile FastPass selections as soon as they enter the park. FastPass time slots will be issued for times when the ride is open to the general public, so you’ll be first in line without having to wait in line! 5. Ride Popular Attractions with the Shortest Durations First. Here’s why this makes sense: If you arrive early and are trying to ride as many rides in as you can before the parks get crowded, hit the rides that take the least amount of time first. Save the leisurely 20-minute long Pirates of the Caribbean boat ride for later in the day when the crowds get thicker. Spend the early hours of your day cramming in coasters and other quick rides. before their lines get super long. 6. Download an App to Check Wait Times. Download the Disneyland app so you’ll be able to check wait times in real time. The app will give you an overview of posted and predicted wait times for all the rides at both Disneyland Park and Disney’s California Adventure. Otherwise, you have to do it old school — checing the Tip Board on Main Street or just showing up only to find long wait times. With the Disneyland app, you can adjust your plans on the fly and have maximum fun regardless of crowd levels. Having a good FastPass strategy is imperative to beating the crowds at Disneyland. The Disneyland Fastpass Service allows you to skip the lines for some of the most popular attractions in Disneyland and Disney California Adventure Parks. You simply insert your park ticket at a FastPass kiosk near the ride of your choice, and you get assigned a time to come back when you can skip ahead of the line. It will also give you a time when you can get your next FastPass. Big Thunder Mountain Railroad in Frontierland is one of the many rides at Disneyland where you can skip the wait with a FastPass. 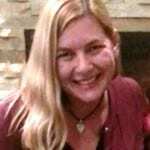 Photo credit: Gwen Kleist, Healthy TravelingMom. Once the parks start getting crowded after the first couple hours of the day, your primary goal to beat the crowds at Disneyland and Disney California Adventure should be to acquire as many FastPasses as possible. Keep an eye on the time your next FastPass will be available, and be ready to grab it right away. So if you see you can get your next FastPass at 2pm and you want to get one for Haunted Mansion, plan to be at the Haunted Mansion FastPass kiosk right at 2. In other words, don’t get in line for a ride in Toon Town at 1:30 or you’ll miss at least an hour of FastPass working for you. You want to avoid time gaps to make sure you can get maximum rides with minimum waiting. TravelingMom Tip: Take advantage of FastPass on the most popular attractions and be prepared for some of them to go quickly. A good strategy is to send a runner in your group to get FastPasses for your top priority ride as soon as the park opens. FastPasses are great, but if the thought of all that planning and running around sounds like too much work, consider buying a MaxPass. While the FastPass system is free, you’ll have to pay a little extra (currently $15 per-person, per-day) for the convenience of using a MaxPass. What makes it worth the cost? MaxPass delivers on the same concept of the FastPass, but you don’t have to go to each kiosk in person to get it. You can make FastPass selections right from the Disneyland app on your phone from anywhere in the parks. The MaxPass also allows unlimited Disney PhotoPass downloads for the day. And the MaxPass keeps getting better! Disney has just announced that in addition to rides, guests with MaxPass can now use it to select FastPasses for entertainment, as well. If you are planning to watch World of Color at Disney California Adventure or Fantasmic! at Disneyland, you can use MaxPass to reserve a spot early in the day to ensure that your family gets a great view of the show! 9. Take Advantage of Single Rider Lines. If you’ve ever gone on Radiator Springs Racers in Cars Land, chances are you waited two or more hours in line for the ride. But did you know you could have waited a fraction of that time by using the single rider line? With the single rider lines, you still wait in line with your peeps, but you’ll all ride separately. Basically, single riders are used to fill empty seats in ride vehicles created by other groups riding together. The single rider line is much shorter and goes much quicker than the regular stand-by line. This is a great way to beat the crowds on busy days! 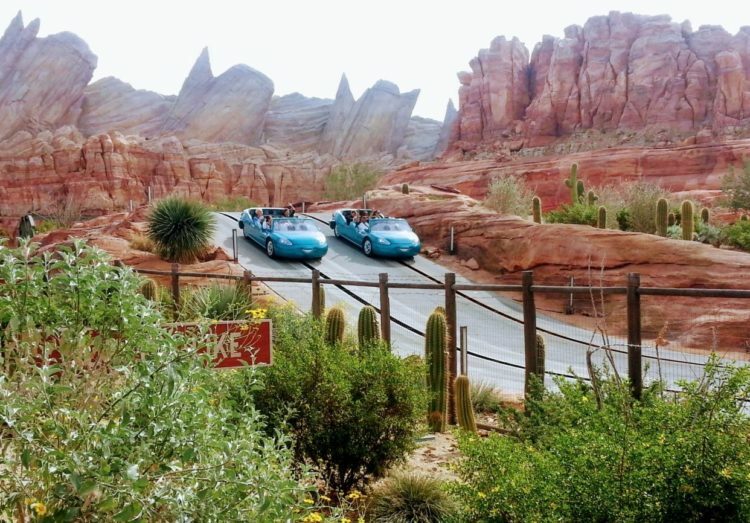 Radiator Springs Racers in Cars Land has a single rider line to help shorten wait times. Photo credit: Gwen Kleist, Healthy TravelingMom. Of course, if you want to ride together as a family or have young kids, this won’t work for you. There is a minimum height requirement for single rider. But if your kids are tall enough, you should definitely take advantage of single rider lines! 10. Slow Down in the Afternoons. Crowds will peak at both parks in the afternoon. Some people recommend that you that take a break and go back to your hotel room for a rest. But if you are like us and hell-bent on sucking every minute of fun out of the day, visit less popular rides and non-ride attractions during the afternoon when lines are long for popular rides. Here are some of our favorite attractions to visit in the afternoon where the crowds are guaranteed to be light. Redwood Creek Challenge Trail at Disney California Adventure Park never has a wait and is a fun spot for kids to run around. Photo credit: Gwen Kleist, Healthy TravelingMom. 11. Eat Meals at Off-Times. Most quick service locations in the parks tend to get busy around noon for lunch, and 6pm for dinner. If you don’t have a restaurant reservation, plan to eat your meals at off hours to avoid long lines and to have a better chance of finding a table easily. 12. Use Mobile Food and Beverage Ordering. The Disneyland app recently added mobile food ordering and it’s a game changer. This new feature allows you to view a restaurant’s menu and pricing, place your order, pay, and pick up your meal at the restaurant all without ever having to wait in line. 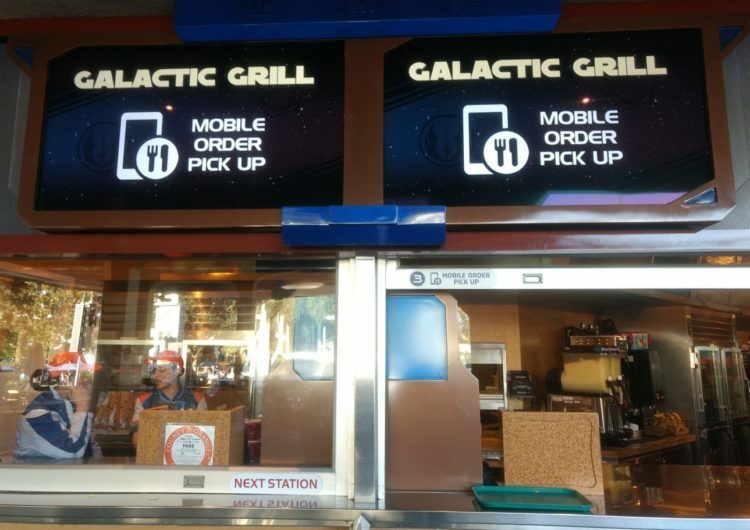 Mobile orders make getting a meal or snack at Disneyland fast and easy. Photo credit: Gwen Kleist, Healthy TravelingMom. 13. Skip the Nighttime Shows. It may sound counter-intuitive, but go to Frontierland while Fantasmic! is happening. While everyone is gathered around the lake watching the show, the lines in Frontierland and neighboring Adventureland are typically quite short. We’ve been known to step right on Pirates of the Caribbean and the Haunted Mansion without any line at all! If you’ve visited Disneyland before, you know that huge crowds gather at night for fireworks and the Fantasmic! and World of Color shows. Main Street becomes packed, and it’s nearly impossible to “swim upstream” to get to other lands after the fireworks end. This is not only because of the sea of people trying to exit the park, but because cast members are trying to direct foot traffic in one direction. For these reasons, if you’ve got the stamina to stay late, hit the rides and attractions in the opposite direction of Main Street and the exits. While the crowds are making their way out of the park, you’ll be hopping on Autopia with little to no wait at all. 15. Keep It All in Perspective. Disneyland is popular; it’s going to be crowded no matter when you go. That’s just a fact. But keep it all in perspective! You’re at Disneyland. Life is good! Don’t let the crowds ruin a fun time. By knowing what to expect and how to best manage your time and the crowds, you’re going to have an awesome time.